Here's a classic sucker effect reformulated for the kids magician. It's the Fooled and Fooled Again plot with colorful jumbo cards portraying very cute, very kid-friendly pictures of bunny rabbits. You show a fan of just three jumbo cards with different colored rabbits -- two yellow and one green. You cover them with a handkerchief and claim your going to make one disappear. You remove the two yellow rabbit cards and then "clumsily" vanish the last one. Of course the kids are on to you, yelling and screaming, "It's under the scarf!" 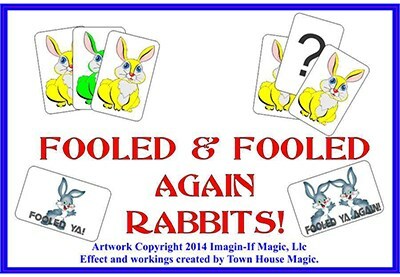 After much denial, you finally admit that there is a card under the hanky and you reveal the card which shows a different rabbit and the words "Fooled ya!" printed on it. The kids, undeterred will tell you to turn it around. Of course, you'll pretend to misunderstand them a few times until they are screaming at a high pitch. When you finally concede, they'll see the back of the card with two rabbits, which reads, "Fooled ya again!" And then, for the big finish, you "find" the green rabbit in your hat, an envelope, under a seat cushion, or anywhere in the room you want! You get a set of jumbo cards and the self-contained gimmick. The cards are gorgeous. Big, bright and digitally printed. Set consists of all jumbo cards needed to perform including gimmicks which are self contained. Get Fooled and Fooled Again Rabbits and you'll have a sucker classic trick with a decidedly different plot that will complement your kid show repertoire and really get those kids screaming!